From being continuously “watched and monitored” by Pakistan’s ISI to denial of basic fundamental rights including access to judiciary and fair trial, people in Pakistan occupied Kashmir have suffered gross violations of their rights, according to the Human Rights Commission of Pakistan. Punjab and Haryana have earned the dubious distinction of being among the top five states in terms of decline of water table and over-exploitation of ground water resources. A day after Mumbai MPs met Congress President Sonia Gandhi to convey their concern about the ongoing demolition drive in the city, Maharashtra Chief Minister Vilasrao Deshmukh arrived here to explain his position to the leadership. 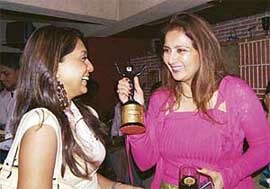 Actress Poonam Dhillon shows award of the best comedy Hindi play of the year for ‘‘The Perfect Husband’’ to a friend in Mumbai. In the intense personalised attack between JMM chief Shibu Soren and rebel candidate Stephen Marandi, it is the BJP which is smiling. Mr Marandi’s rebellion seems to have given the BJP visions of a victory in this JMM-dominated region. The government today approved the new “Rural Electricity Infrastructure and Household Electrification” scheme providing free single-point connection to households below poverty line and a decentralised power distribution and supply system. The Election Commission today ordered repoll in 262 polling stations in Bihar and 28 in Jharkhand, where second phase of assembly elections was held on February 15. The repoll would take place tomorrow. Actress-turned-MP might be pleading the BJP (BJP) case in Bihar, but confesses to be a fan of the party’s bête noire - Railway Minister Laloo Prasad. “I am a fan of Laloo. I love his rare style,” gushed the Bollywood’s “Dream Girl”. Tripartite talks involving the Centre, West Bengal Government and the Darjeeling Gorkha Hill Council remained deadlocked today over holding of elections to the Council and granting of more powers to it. Main Aisa Hi Hoon all set to hit theatres. From being continuously “watched and monitored” by Pakistan’s ISI to denial of basic fundamental rights including access to judiciary and fair trial, people in Pakistan occupied Kashmir (PoK) have suffered gross violations of their rights, according to the Human Rights Commission of Pakistan. “The Inter-Services Intelligence (ISI) has a strong presence in the region (PoK) according to information gathered by the HRPC and people here continuously feel they are being watched and monitored,” said a report released by an 11-member delegation of the commission which had been on a fact finding mission in PoK. The government is also said to lack control over the state’s natural and financial resources and decision on their use. “A number of people mentioned that Pakistan’s ‘injustice’ as manifest in denial of royalty on hydel generation at Mangla Dam to Azad Kashmir,” the report said. On the status of security in the 13,297 sq km stretch, the report said the judicial powers of the people were undermined and rights to expression are violated. “People feel that civil and political rights of Kashmiris on both sides of the LoC have been infringed,” it said adding that under the guise of the ‘Maintainance of Public Order Ordinance,’ which prohibits activities that are prejudicial to public safety, the fundamental freedom of the public is violated. The delegation, which visited Muzaffarabad, Mirpur, Bagh and Rawalkot districts from July 16 to 19, also met government officials including top politicians, journalists, lawyers, judiciary members and various political parties of PoK. The report touches upon several heads which include press freedom, status of women and children, education, health and employment, prisons and militancy which reflects on the human rights issues involved in these sectors and is published by the agency under the title ‘Visionaries’. The plight of women, however, brings a little cheer to the report which claims that their literacy rate is 46-50 per cent higher than many of the neighbouring communities. Punjab and Haryana have earned the dubious distinction of being among the top five states in terms of decline of water table and over-exploitation of ground water resources. If that were not cause enough for concern, experts say, excessive application of irrigation and fertilisers is turning large swathes of land in these two states into wastelands. The data collected by the National Remote Sensing Agency, which mapped wastelands in the country in 2002, shows that a 2,228 square kilometre area in 17 districts of Punjab has turned into a wasteland. Similarly, a 3,733 sq km area spread across 19 districts in Haryana has turned into a wasteland. “A comparison with the 1995 survey shows only a marginal increase in wastelands in Punjab and Haryana but if the trend continues for the next decade or more, soil productivity will reduce and profit margins will show a sharp decline,” says Mr Vijay K. Sardana of the Society for Promotion of Wastelands Development. “At least 50 per cent of these wastelands can be made productive with reasonable efforts. Technologies like water harvesting can help in reclamation of wastelands, which can then be put to multiple uses,” he observes and cites the case of Rajasthan where farmers make an additional income by using fallow wastelands for cultivation. Besides Punjab and Haryana, the other three states that are worst affected by the declining water table are Delhi, Rajasthan and Tamil Nadu. The Central Ground Water Board says fresh water zones in some areas of Delhi will become unavailable for exploitation within the next decade if the rate of exploitation of ground water continues. The worst affected areas of Delhi are south west and south districts, which have been notified by the Central Ground Water Authority for control and regulation of ground water development. It has issued directions to housing societies and industries in the notified areas of Delhi, Faridabad and Gurgaon to adopt rain water harvesting system. In south west Delhi, water table is declining at a rate of 0.93 metre per year. The Central Ground Water Board has also proposed a centrally sponsored scheme at an estimated cost of Rs 175 crore for artificial recharge to ground water and rain water harvesting during the remaining part of the 10th Five Year Plan. After his 45-minute meeting with the Congress President, Mr Deshmukh told mediapersons that as per the commitments made in the party’s election manifesto, slums which came up before the cut-off date of 2000 would not be razed but those which have mushroomed in the past five years will be removed. In other words, the demolitions will continue but the sanctity of the 2000 deadline, mentioned in the election manifesto, will be respected. Besides triggering public protests, a section in the Mumbai Congress unit openly criticised this move while its coalition partner, the Nationalist Congress Party (NCP), also distanced itself from the government’s decision. Having under all-round attack, the Chief Minister today explained that as mentioned in its election manifesto, the ongoing drive was limited to slums which came up after 2000 and were located on government properties. He said about 90,000 hutments were removed as this land was required for development projects but, in the process, a large number of hutment dwellers who have been residing in these hutments before 2000 were also affected. Mr Deshmukh said a rehabilitation package for about 5,000 such slum-dwellers will be formulated to compensate them adequately. Mr Deshmukh said the Maharashtra government had enacted a legislation in 2002 laying down that hutments coming up after 1995 will be declared illegal, making it a cognisable and a non-bailable offence. Although this law was endorsed by all political parties, it was never implemented because of which, the slums continued to grow. However, the cut-off date mentioned in the law has been extended to 2000 following a commitment to this effect in the party’s election manifesto, he added. In the intense personalised attack between JMM chief Shibu Soren and rebel candidate Stephen Marandi, it is the BJP which is smiling. Mr Marandi’s rebellion seems to have given the BJP visions of a victory in this JMM-dominated region. The BJP cadres are enthused and the party is expecting a rich haul in the 18 assembly seats of Santhal Parganas. Both Mr Marandi, who is contesting as an Independent, and Mr Hemant Soren, son of JMM chief Shibu Soren, find BJP as their main rival in Dumka. The tribals constitute nearly 34 per cent of the population of the seat where Mr Marandi has won five successive assembly elections. There is little to suggest today that Mr Marandi and Mr Soren were friends not too long back. The pamphlets circulated ostensibly on behalf of Mr Marandi by a Jharkhand Budhijivi Manch, an NGO, accuses Mr Soren of betraying the movement for creation of Jharkhand state at crucial junctures. Mr Soren has been branded as an “outsider” who did not have the guts to contest from his “native Hazaribagh.” The pamphlet blames Mr Shibu Soren of turning the JMM into a MBBS (Mian biwi bachho samet) party. Mr Marandi’s supporters deny that his contesting as an Independent will affect his support base in the JMM. “He has been elected mainly because of personal popularity. Several parties, including the RJD, and the LJP, are supporting us,” says Shiv Narain Singh, a supporter of Mr Marandi. With his prestige at stake in Dumka, Mr Shibu Soren today addressed rallies in rural areas of the constituency. The JMM chief’s elder son Durga Soren is contesting from neighbouring Jama. JMM leaders accuse Mr Marandi of stabbing them in the back. The BJP is leaving no stone unturned to capitalise on the JMM split. Sangh organisations have chipped in to ensure effective booth management. The party is also banking on the work done by the state government in the past four years. The BJP candidate from Dumka, Mr Moharil Murmu, was an MLA of the JMM from the neighbouring Jama. Mr Durga Soren replaced him as the JMM candidate in 2000 elections, which made him to first join the Congress and later the BJP. With Mr Marandi having put up Independent candidates in a few other seats of Santhal Parganas, the BJP is confident of the JMM split causing a ripple effect across the 18 seats in the region. The government today approved the new “Rural Electricity Infrastructure and Household Electrification” scheme providing free single-point connection to households below poverty line (BPL) and a decentralised power distribution and supply system. The existing scheme of “Accelerated Electrification of One Lakh Villages and One Crore Households” will be replaced by the new scheme in which the ‘Minimum Need Programme’ for rural electrification will be merged, said an official statement, released after a meeting of the Cabinet Committee on Economic Affairs. The scheme would provide for 100 per cent subsidy for single-point connection to households below poverty line the release said. It would also create village electricity infrastructure and provide decentralised power distribution and supply system, the statement said, adding the scheme enjoys 90 per cent capital subsidy to finance projects for the creation of rural electricity distribution backbone of 33/11 KV or 66/11 KV sub-stations. The CCEA also gave its approval to the implementation of Phase I of the scheme in the 10th Plan and obtaining prior commitment of the states before the grant of subsidy to the use of franchisees for the management of rural distribution in projects financed under the scheme and to the provision of the requisite revenue subsidies for the state utilities by the state governments. The government also set the terms of reference for the Commission on Economically Backward Classes (EBCs), asking it to submit recommendations within six months from the date of appointment of its Chairman. The Union Cabinet, at its meeting chaired by Prime Minister Manmohan Singh, approved the estimated expenditure of Commission over the six-month period at Rs 1.07 crore. While approving the continuation of the panel for EBCs not covered under the existing reservation policy beyond this January, the Cabinet gave its nod to four-point terms of reference, including recommending welfare measures and quantum of reservation in education and government employment in consultation with the National Commission for Religious and Linguistic Minorities. The panel has also been tasked to elicit the views of state governments and Union Territories on the matter and suggest criteria for the identification of the EBCs. The commission would also be asked to suggest necessary legal, constitutional and administrative modalities required for the implementation of its recommendations. The Cabinet also approved the creation of the post of a chairperson, a member and a member secretary, besides supporting staff, their accommodation and the stationing of the headquarters in Delhi. The Union Cabinet also approved a relief and rehabilitation package involving a sum of Rs 821.88 crore for the tsunami-hit Andaman and Nicobar Islands. The package includes an immediate relief and response assistance of Rs 313.19 crore, Rs 215.65 crore for intermediate housing and relief employment generation and a special Rs 239.54 crore package for the revival of agriculture. The Cabinet also gave its approval for the construction of 10,100 intermediate shelters for the tsunami-affected families in the islands and sanctioned Rs 96.33 crore for the purpose. The Group of Technical Experts has recommended plans for intermediate shelter units indicating the alternative materials which are feasible for use in the shortest possible time and at reasonable cost for the construction of these intermediate shelters, the release said. The Cabinet also approved a proposal to declare the National Agricultural Cooperative Marketing Federation (NAFED) as an agency for undertaking price support operations in cotton in addition to the Cotton Corporation of India. The CCCEA also approved Rs 167.05 crore for upgrading the IT infrastructure of Customs, Excise and Service Tax departments to boost trade. The Union Cabinet today gave an ex-post facto approval for the implementation of the agreements on visa free travel for the holders of diplomatic and official passports between the Republic of India and Laos, Romania and Tajikistan. As per the release issued officially, under the agreements, a citizen of one country holding a valid diplomatic or official passport would be exempt from visa requirement while entering, transiting through or existing in the territory of the other country. In the case of Laos People’s Democratic Republic and Tajikistan the said passport holder shall be allowed to stay in the respective country’s territory for a maximum of 30 days without a visa, the release said. The Election Commission has ordered repolling in polling stations spread over 14 districts in Bihar and four in Jharkhand following reports of excess percentage of polling and malfunctioning of Electronic Voting Machines (EVMs), EC sources said today. The commission had earlier said that it would order repoll after scrutinising the registers from where more than 68 per cent of polling was recorded. Repolling in these polling stations would take place along with elections to three Assembly constituencies of Bahera, Ghanshyampur and Jale where polls had earlier been postponed due to inadequate security arrangements. To which, Laloo Prasad retorted: “Unhe mohabbat ho gayee hain (She has fallen in love with me).” Like she did in some of her films, Hema Malini could be said to be playing a double role. Tripartite talks involving the Centre, West Bengal Government and the Darjeeling Gorkha Hill Council (DGHC) remained deadlocked today over holding of elections to the Council and granting of more powers to it. While DGHC Chairperson Subhash Ghishing insisted that empowerment of the Council is essential before the conduct of elections, West Bengal Chief Minister Buddhadeb Bhattacharjee asserted that the issue of empowerment could be decided “simultaneously” with the elections to the Council. Realising the stubborn stand taken by the West Bengal Government and DGHC chief, Union Home Minister Shivraj Patil thought it fit to keep the Centre away saying the two sides should meet again to sort out the issue. “Certain things are to be decided by them (West Bengal Government and the DGHC for that they will have to meet again,” Mr Patil said. The hill council elections, according to legal provisions, would have to be completed by March 25. The Left Front is attaching great significance to conducting elections to DGHC as it is legally manadatory. But Mr Ghising is insistent that his demands, including his right “to control hill police” be handed over to him. New Delhi: The National Minority Commission Chairman, Mr Tarlochan Singh, said on Thursday that the issue of granting Scheduled Caste status to Rai Sikhs by the UPA government violate the model code of conduct in view of the Ajnala Assembly by-election. He in a letter to the Chief Election Commission, Mr T.S. Krishna Murthy, said, “It is a clear case of violation of the model code of conduct.” He said Rai Sikhs constitute 15 to 20 per cent of the total Sikh population in the Ajnala Assembly segment and the Congress government in Punjab was trying to woo the voters.